AI (Artificial Intelligence) holds out great potential for the public sector – but steel yourself for the same wave of hype, disappointment and slow progress that have marked other tech revolutions, such as the Internet. That was the sober guidance from tech and society change watchers Nesta at last week’s well-attended Think AI for Public Sector one-day conference. “We have to expect the same patterns we’ve seen before,” cautioned the organisation’s Chief Executive, Geoff Mulgan. “That means exaggerated claims, massive vendor promises and equally massive resistance – which eventually turns into sensible and realistic ways of getting the real value out of the new stuff,” he added. 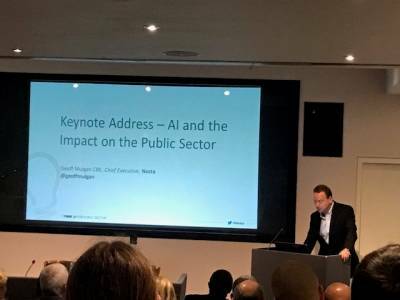 Nesta, a UK charity with a global purview of tech’s impact on society, has been researching AI’s impact round the world, working with 40-plus governments, Mulgan told an audience of public sector IT practitioners and decision makers. That on-going dialogue is the basis for Mulgan’s view, he went on, that after 70 years ‘AI’ is really starting to happen in the mainstream. Telegraph: Is the UK facing an AI ‘brain drain’? Could AI lead to a major British jobs boom? “We see that in everything from the popularity of Alexa in the home and now business contexts too, as well as innovative apps that use Machine Learning to mine data for citizen users, like the parking ticket challenge app DoNotPay,” he pointed out. But there is equally a growing sense of unease about potential misuse of citizen/consumer data, such as debates about police profiling systems in the US that seem to reflect racial bias. For Mulgan, though, social attitudes are most likely to change when it becomes more clear that instead of being a job-killer, AI may well lead to job growth – especially in the public sector. “Counter to many doom and gloom predictions, while some careers will be automated, the ones that centre on the things AI will probably never be good at, like caring and interpersonal skills, which are the central facet of so many public sector careers like teaching and health, will actually expand,” he predicted.